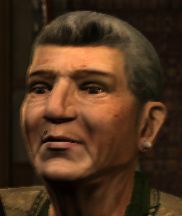 Maureen McReary (Irish: Máirín Mhic Ruairi) born in 1935, is a character in the HD Universe appearing in Grand Theft Auto IV. She is the elderly mother of Derrick, Francis, Patrick, Gerald and Kate McReary. Through and through the struggles of the family, she is intent on keeping them together and instilling values - every Sunday she would take her husband and children on a picnic after church. When Gerry went to juvenile hall in 1986, she ritualistically still set a place for him at the table, until her husband was drunk, angry, and threw the plate against the wall. She is well aware of her sons' criminal activities and also believes that her late husband is "in hell". Patrick seemingly dislikes being under his mother's wing at times, but is really loving towards her, and cares about her deeply. At the end of the Revenge storyline Patrick comforts her after Kate's murder. The fate of Maureen after the events of Grand Theft Auto IV are unclear. Considering that by the end of the game Patrick is the only child willing or able to help her, it is strange that he would leave the city after the events of the game unless she had passed away. However this is never stated in the game, nor by Packie during his appearance in Grand Theft Auto V.
This page was last modified on 27 February 2014, at 07:38.